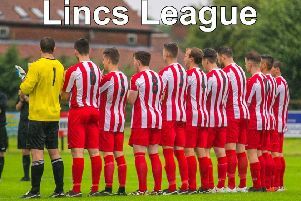 Horncastle Town reserves finished their Lincoln league campaign with a win to round off a season that the players and management can be extremely proud of. Again, it was a changed team from the previous week with brothers Scott and Dave Maplethorpe taking over the central defensive areas, Callum Low returning from first team duty and Lee Wilson starting in midfield. The game kicked off in frantic style with home keeper Jason Stamford having to parry a close range shot. Town immediately counter attacked with Luke Blondel firing a shot at the keeper with the rebound going to Daniel Bodily who shot wide from seven yards. It was to Crown who took the lead on 12 minutes when a long ball was fired in only for Stamford to punch to Gareth Williams who found the bottom corner. It took until the 26th minute for Town to get on level terms. Bodily crossed to Ryan Beaumont who made no mistake from 18 yards, leaving the keeper flat footed. Town were using their pace up top with Crown playing a high line defensively. The hosts took the lead when Beaumont beat the offside trap and unselfishly set up Ben Fidling to tap in from six yards. Town were playing confidently and were unsettling the opposition. On 40 minutes, they won a free kick on the right side of the penalty area. Fidling floated a lovely ball in for Blondel to flick on .The ball was hitting the back of the net but Beaumont sneaked in at the last minute to chest and claim his second of the game. A minute later, Beaumont got his deserved hat-trick. Again, he beat the offside trap and ran 25 yards to slot past a the keeper and give his side a 4-1 lead. The second half kicked off the same way as the first half finished with Town playing some lovely pass and move football. They had the first chance with Beaumont again one on one with the keeper but a heavy first touch meant the chance was lost. Happily, Fidling didn’t make the same mistake on 60 minutes. Beaumont turned provider and Fidling, with only the keeper to beat, lifted the ball over into the net. Jamie Lewis replaced the injured Low at right back and Josh Cheetham replaced a tired Daniel Bodily on the right wing. Midway through the half a well worked corner for Horncastle nearly produced another goal. The corner was flicked on only for Blondel to fire over a difficult chance from three yards. It got easier for Town when Crown and Arrows were reduced to 10 men for foul and abusive language towards the referee. Daniel Garnett replaced Beaumont on 67 minutes with Lewis moving to centre forward for a last 20 minutes cameo. However, it was the away team who struck back. The ball was played through to Liam Bentley who found the bottom corner from close range. Crown went close again before Blondel restored Town’s four goal lead after 78 minutes. The goalkeeper tried to dribble out of his six yard box but was robbed by Blondel who could not miss. Minutes later, Lewis went on a run and beat two defenders on the byline to cross for Blondel only for the keeper to make an excellent save. However, Town were not to be denied a seventh when Lewis confidently sprang the offside trap with his pace and skill to finish off a deserved win.